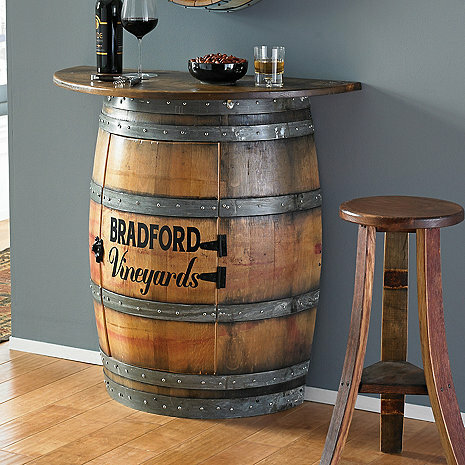 This personalized half barrel bar is big personality built to accommodate smaller spaces. A reclaimed rough sawn wood bar top turns a recycled wine barrel into a perfect bar, ideal for any room in your home. The hinged door opens to reveal an inner shelf and plenty of storage for your bottles and barware. Personalize with family name to represent your own personal vineyard. Could this be used outside or is it just for inside? BEST ANSWER: The Personalized Half Barrel Bar is designed to be an interior piece. I wouldn't advise you expose the bar to the elements as it is not weatherproofed. what height of stools do you recommend? What is the weight of the half barrel? BEST ANSWER: Julie C, The weight of this piece is approximately 75 lbs. Is it free shipping or do I have to pay 250 more? BEST ANSWER: The Personalized Half Barrel Bar does have an additional shipping fee of $250 which includes delivering the bar to your first enclosure (front door, porch, basement, garage). Hi, do you ship to Australia, Melbourne? Finished very shoddily! Certainly over-priced - significantly!!! Not happy about itâ?¦. Bought for my husband. Item is exactly as pictured! Great purchase. What a way to preserve a barrel! Even has some red wine staining. The lettering was perfect and exactly what we ordered. Can't wait to buy another one for my daughters wedding-it was a pleasure from start to finish-quality is amazing! Its as good as you can get. This looks great in my wine cellar. It's rustic and I would not put it in a room with fine furnishings. It's a bit overpriced although couldn't find anything similar for any less. Shipping seems high but its and odd size. I put a low voltage light in it and back light the walls. Awesome!